Years ago, as part of a team-building exercise, I climbed a telephone pole, stood straight up on top, and leaped off. Not too many years before that, I also jumped out of an airplane and parachuted to the ground in a country not my own. As anyone who has vaulted him- or herself from a height will tell you, the rush combines unadulterated fear and solid exhilaration. Also? Every part of the journey counts: the steps to the top, the preparation for the jump, the discussion about safety, the spring into the air, the free-fall to the ground, the “stick” of the landing, and (finally) the processing of all.the.things. Autumn after “sticking” her leap from a tree at Hollybank Treetops Adventure Ropes Course in Launceston, Tasmania in Australia. Sometimes in life, we make decisions that feel an awful lot like leaping off the top of something tall. In 2016, selling everything for what we believed would be a life on the sea, was one such decision. That “leap,” as many of you know, didn’t turn out exactly as planned, but instead set forward a different kind of journey that sent us quite literally on a trajectory around the world. I would say that in some respect, this part of the adventure — the course from house to boat, then to backpacks and planes — ushered in the fast-paced, anxiety-inducing, bliss-producing free-fall that has been our lives for the last two years. And the “something” that happens during every free-fall — the hyper-zoom focus, if you will — materialized in our travels, bringing clarity and perspective like nothing else we’ve ever done. Constant togetherness is hard. To make it work requires continual give-and-take with extra doses of forgiveness and courteous goodwill. It means hurt feelings, true colors revealed, and dashed expectations. But it also means loads of inside jokes, copious amounts of laughter, and tremendous personal growth. Getting to the good stuff requires leaning into and persevering through the hard. All those lessons we learned about constant togetherness in family? It’s exactly how God hopes we live together as His church family. But we don’t? WHY. IS. THAT? Speaking of God… It seems He doesn’t need us for His plans after all. Instead, He wants us to be part of them. In fact, He commands us to be part of them and is very specific in how He’d like us involved. (See Matthew 28:18-20 or Mark 12:29-31, for example.) In light of these truths, it’s kind of absurd and even a little bit arrogant to set out to “do something big for God.” The question isn’t how big is my work for God; the question is how obedient am I to His commands. We lived without extended community for almost two years. While living outside of community alleviated the headache of relational work, it also brought on an unexpected and stark loneliness. We had the amazingness of each other, sure, but there is something to be said for friends and family and teachers and co-workers and classmates and coaches and dentists and doctors and pastors and postal workers and store owners who know us by name. There is something more when any one of those people knows us well enough to double our joy and divide our sorrow. Ain’t nobody got time for shallow friendship. Go deep or go home. 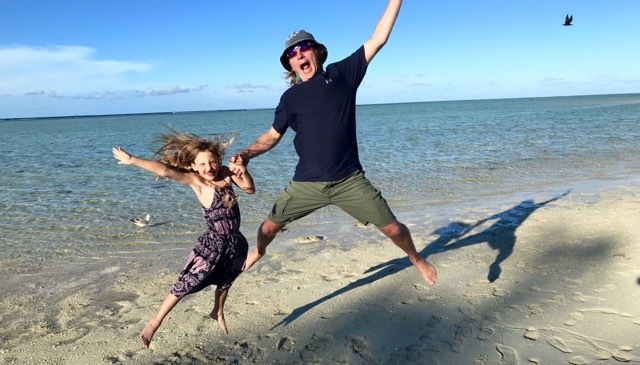 Mitchell & Eden leaping on the beach on Heron Island at The Great Barrier Reef in Australia. I could literally keep writing for days about all we learned through this two-year journey. But what strikes me most at the moment is this: had we not taken the leap (you know… leaving it all, buying the boat, selling the boat, traveling around the world), these lessons (and so, so, SO many more!) may never have come into focus! Please note: I’m not suggesting one needs to leave it all, buy a boat, sell a boat, and travel around the world. It’s certainly NOT something I’m interested in doing again anytime soon (at least not the leaving it all or the buying and selling of the boat, LOL! ), and I’m not suggesting it for you, either. I do propose, however, exercising a little of Seth Godin’s advice. He recommends “turning some of your decisions back into leaps.” It’s good counsel, I think. And as we slip back into a rhythm of routine in our rural hometown, I hope to be mindful of taking some leaps in the midst of my everyday schedule. I’m not sure, yet, what those little leaps might look like — starting some online classes? writing up a book proposal? asking a new friend to dig into Scripture with me? — but I do know this: lessons from the leaping etch deep and forever in the soul, and that’s exactly where God does His best work in us all. How about you? What decisions might you “turn back into leaps” today? 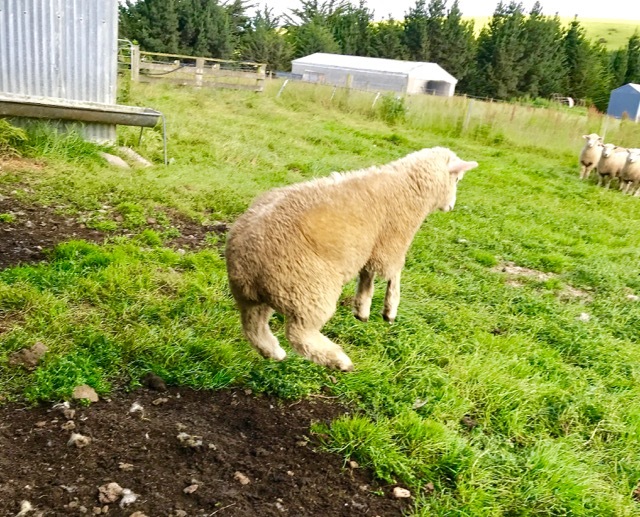 A sheep leaping free from the slaughter line at Jo & Simon Davies’ sheep farm in Toko Mouth, New Zealand. Rhonda & the girls leaping and bounding — prancing, if you will — in La Plaka in Athens, Greece. Cover photo: Mitchell leaping off of a monument called “The Basket of Dreams” stationed at the top of a hike in Queenstown, New Zealand.